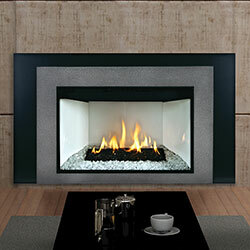 We offer our Luxury Direct-Vent Inserts in two sizes and two styles. Our traditional Innsbrook insert features a seven-piece, hand-painted log set exquisitely detailed with bark, wood, and charring - all set atop a unique burner designed to create a stunningly realistic fire. The unique diamond-pattern burner in our Loft contemporary insert serves as a blank slate, inviting you to add decorative glass in the colors and styles that best suit your decor. The deep V-shape in the back of the required porcelain liner maximize the flame's flicker, creating captivating views from any angle. The porcelain liners and matching burner tops are available in rich black and ultramodern white. Both insert styles feature a modern clean-face look - without visible louvers and with the front-mounted valve and control module neatly concealed behind the surround. The large view window (400 sq. in. on the DXL/DXT30 and 584 sq. in on DXL/DXT35) allows an unobstructed view of the fire. An intuitive battery-operated thermostat remote comes standard and lets you light the fire, control the flame height, and vary the speed of the built-in blower. In Smart mode, the thermostat automatically reduces flame height and blower speed as your room reaches the desired setting - eliminating temperature fluctuations.